Both original glass window covers intact, one has a tiny nibble at edge. Rich gold fill. Display pieces not included. Set w/ a paste stone. Antique Gold Filled Monogramed Locket is 1 1/8”. Finish is in great shape. The closure works fine. Antique Victorian Etched Gold Shell Filled Oval Locket. Shipped with USPS First Class Package. Double Photo Locket Top Tests 10K-12K Solid Gold With Locket Testing Gold Filled Or Plated. IT HAS A CRESCENT MOON AND STAR DESIGN. IT HAS DARK COLORED FACETED STONES SET IN THE CRESCENT MOON AND STAR. Natural tiny diamond in the front. Locket is in about as lovely a condition as a person could wish for. Beautiful when worn, will include the chain I have had it on (also gold filled) which is how I have worn it. Antique 1800’s Floral Bird Locket! Tricolor Gold Filled, Sweet! Antique 1800’s Floral Bird Locket! Sweet! In nice condition, just a little wear. The locket is tri color gold, yellow, rose and green gold. Measures about 21mm in diameter. Please don’t hesitate to ask questions, thanks. Weight: Necklace weighs 53 grams. Hallmarks: No hallmarks found but we have not attempted to remove the photograph / bezel to see if the piece is hallmarked behind the photo. The top has a nicely engraved design along with a faceted glass paste sitting at the center. CONDITION: Very nice outside. There are no rims or plastics on the inside. Original paper bottom appears to be intact. Antique gold filled locket pendant. Not marked. The stone in the center looks like an opal, but it's quite small so I'm not 100% on that. Faux pearls. It closes with a snap and remains securely closed. Lovely Victorian gold filled locket in the shape of a pansy. The Victorian symbol for love. Nice large size. The locket is set with colored stones. The locket doesn't appear to have any marks. Gorgeous golden solid brass ornate locket. locket approx. You may also be interested in. Nice old locket. We do not deceive. All flaws are either photographed or described or both. It is in good shape. the plastic covers and the rings to hold the pictures are intact on both sides. Has a gold filled chain.this is as found at an estate sale. 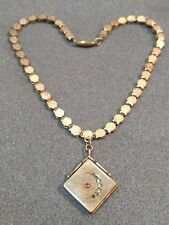 This is a lovely octagon engraved goldfilled locket and chain. In excellent condition and hangs on nice vintage 18" chain. Just beautiful!! I always combine shipping. Prefer to ship priority, but can do 1st class for less money. Overseas is $14.00. The locket has what appears to be woven hair on one side below the bezel and cover glass and the other side is empty but does have the bezel and cover glass so its ready for a photo (probably originally had a daguerreotype). Antique WS&B gold plated etched Victorian Photo locket. The bale has a small crack. Opens to photographs of young women. Minor dent and scratches to reverse. Interior metal plating wear. Antique VICTORIAN Memento Gold Filled Locket From Bracelet ?? Its a Victorian Gold filled setting. May of been from a bracelet.it has an ornate etched boarder. hinges and clasp work well. its in good condition.may need a cleaning from age and storage. For sal is an Antique Victorian Engraved Gold Filled Locket fancy link necklace. In good pre owned condition no dents closes securely. Has a darkening but no wear. No marking or monogram on locket chain is marked on tag and clasp 1/20 12k gf with bb in circles. Please an any questions before purchase. No Returns, prompt payment, see pictures for sizing and condition. Box not included display only. Thanks for looking. Shipped with USPS First Class Package. IM NOT SURE IF THIS IS MORNING JEWELRY OR JUST A LOCKET FOR PHOTOS. IT HAS A HAND ENGRAVED SCENE OF A LIGHTHOUSE WITH A SMALL RED STONE SET IN IT. THIS IS AN ANTIQUE GOLD FILLED LOCKET. IT HAS ONE SECTION WITH A LOCK OF HAIR, AND THE OTHER IS EMPTY. Beautiful Antique Victorian Gold filled Etched Miniature Mourning 8 Photo Locket. Book Charm Rare. There are four pages in the “album” and each page has a front and back for a photo. This is just a beautiful piece with stunning details and wonderful history! Antique Victorian Gold-Filled Cross Locket by W&H Co.
(AEB) It is in very good antique condition. The left side of the picture has a reflection not a dent. The rings to hold pictures are there along with one of the original celluloid inserts. It is 30mm across (1 3/16. ). Antique Victorian gold heart and rose locket. Vintage rose and green gold on the locket. Shipped with USPS First Class Package. LOCKET DOESN'T CLOSE. SOLD AS IS. IT HAS 2 COVERS AND 2 PAGES INSIDE. 2.6 gms, 3/4" x 11/16" not including bail. DELICATE VICTORIAN ROSE GOLD LOCKET. THE LID OF THE LOCKET ADORNED. THERE IS NO HALLMARKS, TESTED 14K GOLD. VERY GOOD ANTIQUE CONDITION. THERE IS ONE ROSE GOLD RING INSIDE WITH NO GLASS. This wonderful old Charm has lovely details all around. It's an Antique Rose Gold-Filled Etched Photo Locket Charm or small Pendant. Against its finely etched background is a Floral motif (with the Sun above) set with paste faux stones. VICTORIAN ERA. GOLD FILLED. MARKED: W. &. ENGRAVED FLORAL LOCKET FOB NECKLACE. GOOD HINGE & CLASP. TO US GOOD CONDITION FOR AGE. HEAVY FOR IT'S SIZE 9.9 - GRAMS AS YOU SEE IT. THEY ARE USED AS - IS. VICTORIAN ERA. GOLD FILLED. MARKED: W.&. 15- STONES. FLORAL LOCKET NECKLACE. GOOD HINGE & CLASP. TO US GOOD CONDITION FOR AGE. HEAVY FOR IT'S SIZE 13.1 - GRAMS AS YOU SEE. MARKED "G K & S" AND "14k GF" ON BAIL. Featuring an Antique solid 10K yellow gold (stamped: 10K) Locket Pendant. Heart shaped, with a satin finish. 4.1 grams. Notable Features: Chased floral patterns, original photograph, fleur de lis bale. Pendant Type : Locket. Approximate Age : Art Deco C. 1920 - 1940. About This Piece. Stone(s) Color : --. Closure/Clasp Type : Standard Bale. You are viewing a lovely Antique Victorian gold filled book chain with crescent moon gold filled locket. The locket features a crescent moon and star sn the front with paste rhinestones and holds two photos. For your consideration is this Antique Gold-Filled Heart Locked in Great preowned condition. I make note of any defects I see no matter how small. Ornate Antique Victorian Gold tone red glass stone Locket Pendant, complete with antique photos of mama and papa. The locket is 1 1/4" high, with bale, it is 1 3/4" high. The width is 7/8". MARKED: 10k. GOLDEN SURFACE! I am here to exceed your expectations! There is a Small chain section in the front with a Catch on the end where it likely held a large Locket Pendant originally. There is NO Locket or Pendant on this necklace now. This is aUSED/PRE-OWNED Item -See Below for Condition Report. The antique art nouveau gold filled locket pendant is in very good condition. VICTORIAN ERA. GOLD FILLED. MARKED: R.B.M. CO. 6- STONES. ENGRAVED FLORAL LOCKET NECKLACE. MONOGRAM BACK. GOOD HINGE & CLASP. TO US GOOD CONDITION FOR AGE. HEAVY FOR IT'S SIZE 16.7 - GRAMS AS YOU SEE IT. Antique Victorian Gold Filled Paste Monogram Locket. Shipped with USPS First Class Package. Antique Brooch in Low Karat Gold, looks to be all original. Small item with original plaited hair and original faceted bale. Box is for display only.